Hadaki Knitting bags, kntting totes, pods, cases, zip pouches and more! 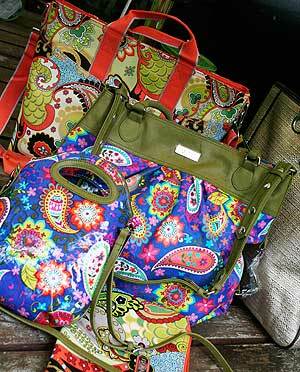 Yes, our regular discounts apply to Hadaki Knitting Totes and Cases! Knitting Totes by Hadaki are bright, beautiful, durable, well made and FUN. In colorful paisleys and pop art prints, and the occasional pink metallic, these totes stand out in a crowd while keeping your knitting projects and the knitting tools and accessores protected. From small pouches, like the small, hip sling pouch, to the oversized french market tote, you can take these puppies to the beach and back - they are easily cleaned and hold up to the toughest treatment. Check out the special attention to details, like double length straps and extra strong hardware!